Eric Dominowski, the fisherman who spotted an alligator in the Lampasas River above Stillhouse Hollow Reservoir last week, read my post on the incident and contacted me via email. Eric was kind enough to answer a couple of questions about the sighting and offered to send me several photos not published by the Killeen Daily Herald in their article last week. Mr. Dominowski said he was approximately 25 feet from the gator when he started snapping pictures. He said as they moved closer the gator slipped into the water and disappeared. He did not see it surface again though he admits to not hanging around very long to look for it. Mr. Dominowski estimates the alligator was at least 6 feet long. Judging by the photos below this is a very healthy alligator. The width of its head, neck, and back are impressive. I was also impressed with the thickness of this alligator's tail. This guy seems to be doing just fine in the Lampasas River. There is nothing in the photos to judge the size of the gator accurately but the characteristics seen in this specimen lead me to believe it is decent sized and, while possibly young, no mere juvenile. It would not surprise me a bit if it turns out Mr. Dominowski's estimate on its length turns out to be on the low side. Enjoy the pictures below. As far as I know this is the only place online that you will be able to see them. A big thank you to Eric Dominowski for allowing me to post the pictures here. 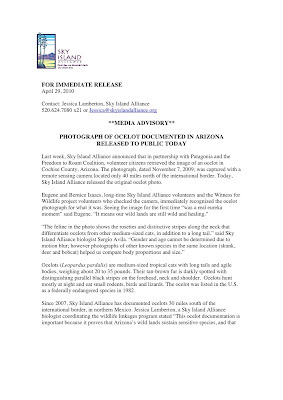 Sky Island Alliance has issued a press release regarding the ocelot that was photographed in Cochise County, Arizona in November of last year. The actual photograph of the rare cat has also been released. Below is the press release and the photo. 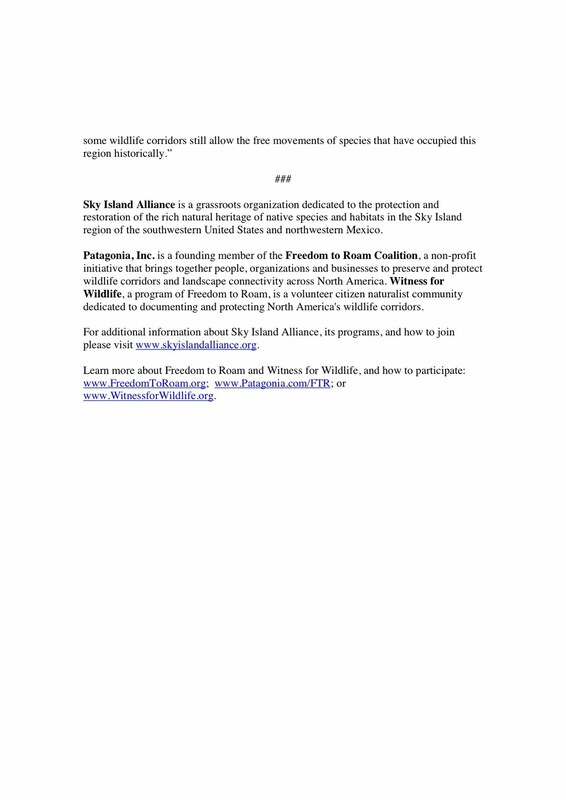 You can click on the press release to increase it in size for easier reading. A recent April Fool's joke seems to have taken on a life of its own here in Central Texas. 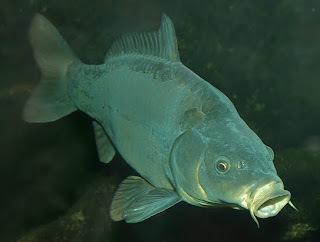 The story of a giant carp, dubbed "Carpie", inhabiting Lady Bird Lake (formerly known as Town Lake) in Austin, Texas was put out by local television station News Channel 8 on April 1 of this year. It is symbolic that the station chose a fish story for their April Fool's Day prank as it seems many have swallowed it hook, line, and sinker. The tale has continued to thrive and I've actually received two emails from readers asking if I knew anything about this fish. So, catch yourself up by viewing the original news broadcast of the "story" here. A YouTube video, embedded below, features several people, including Austin's Mayor Lee Leffingham, who claim to have seen the enormous carp prowling the shoreline of Lady Bird Lake. This video, in conjunction with the News Channel 8 "report", had many monster carp hunters mobilizing for a move on Lady Bird Lake. I have to hand it to News Channel 8. The hoax was a good one. It was depicted in a real enough fashion to fool a lot of folks yet tongue in cheek enough to be seen through by most with any outdoor experience. Also, the prank did not seek to make fun of anyone. So, I have no problem with it. Other than a few red faces there was no harm done. It should be noted that Lady Bird Lake has a reputation as being one of the best 2-3 spots in the country to land big carp. 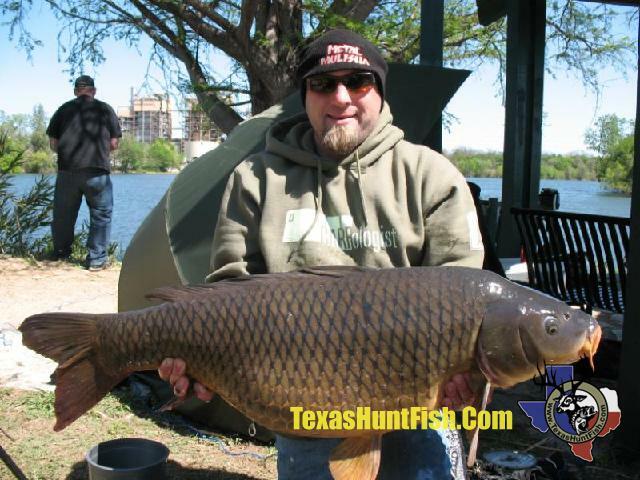 As a matter of fact the Texas state record carp, weighing in at a monstrous 43 lb. 12 oz., was hauled out of Lady Bird Lake by a gentleman named K.C. Crawford. Lobbying efforts are underway by several carp fishing groups to tag Lady Bird Lake as a trophy fishery for carp. This would ensure a catch and release only policy on this species in the lake. A six foot long alligator has been spotted in the Lampasas River north of Stillhouse Hollow Reservoir. The gator was seen twice by a local fisherman named Eric Dominowski last week. Dominowski put his boat in on the main lake and headed upstream to fish for spawning white bass and/or crappie when he spotted the gator. You can read the newspaper account, written by Mason W. Canales, of the sighting on the Killeen Daily Herald's website here. Dominowski said, "It was pretty far upriver. 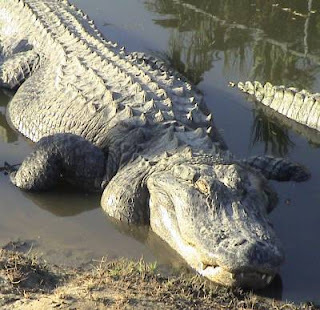 Both times we were up there the gator was lying out there on the bank pretty close to the water...When we got up there he got into the water and we bolted out of there because we couldn't see him." The fisherman was spooked by the alligator's presence and added that he had heard stories about their being present in the Lampasas and Stillhouse Hollow but never believed them. Texas Parks & Wildlife game warden, Fred Churchill said, "It is not uncommon to have alligators there. Reports range in size from anywhere between four and ten feet." Churchill would add, "They are not a problem. There are no issues with them. They are just part of the natural habitat to be in the river...They are just cohabitating with all the other wildlife in the area." I have lived in central Texas since 1987 and have always heard tales of alligators in local rivers and creeks. 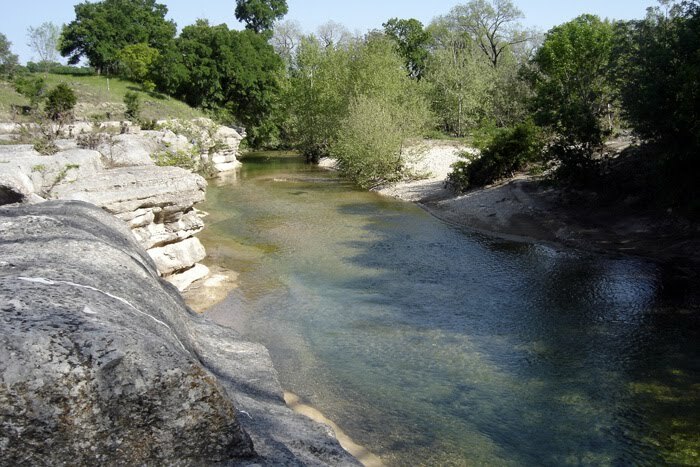 Most of those stories centered around Salado Creek, Stillhouse Hollow Reservoir, and the Lampasas River. Interestingly, I have never heard of anyone claiming to have seen an alligator in Lake Belton which is only five miles north of Stillhouse. According to Dan Thomasson, the Army Corp of Engineer Lake Manager for both Stillhouse Hollow and Lake Belton, reports of alligators have been coming in for 10 years. "The reports that we have gotten have all been in the river above the lake. We have never gotten reports of an alligator being in the main body of the lake," said Thomasson. Game warden Churchill's statement about an alligator living in the Lampasas River not being anything unusual is accurate...sort of. If you look at the graphics below you will see that, while the area where this gator was seen is included as established alligator habitat, it is on the extreme western edge of where they are normally spotted. I would also submit that if the alligators are in the Lampasas River north of the main lake it is likely only a matter of time before they venture down to the reservoir itself. That is, if they haven't already done so. 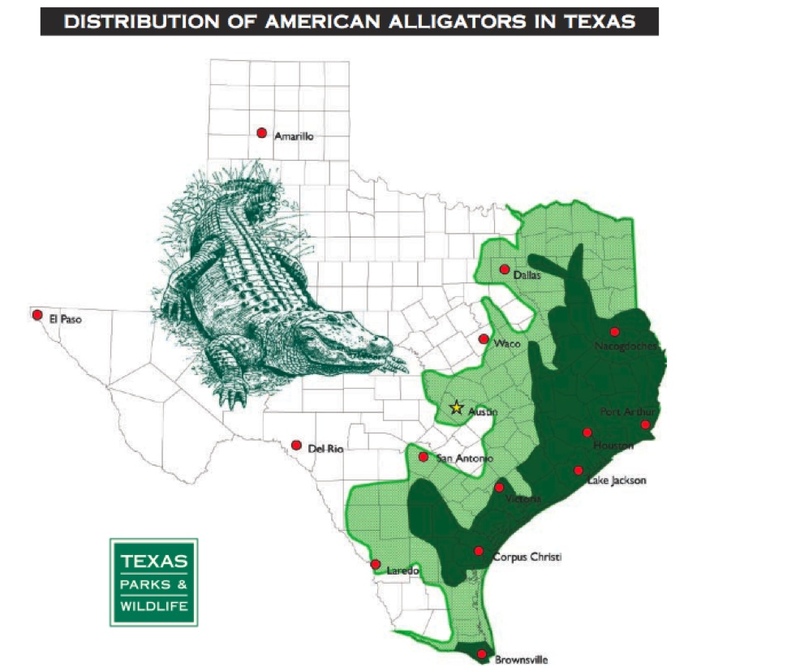 I would agree with Churchill's assertion that the presence of alligators in the Lampasas River, and even in the main lake, for that matter, is not a reason for concern. Use a little common sense and there should be nothing to worry about. As is the case with most wild animals, if you are aware they are around and take appropriate precautions you are unlikely to have any trouble. To the contrary, I think the presence of alligators in the area is a positive sign. It points to a healthy ecosystem. So, fishermen, keep your eyes open and have those cameras ready. If you see any alligators in the central Texas area I would love to hear about it and would also be glad to post your pictures on this site. Those of you who follow such things have probably already read that a rare ocelot has been photographed in Arizona. The photograph once again proves the validity of using remote cameras or camera traps as a legitimate research tool. You can read the full story as it was originally printed on the Sky Island Alliance website here. 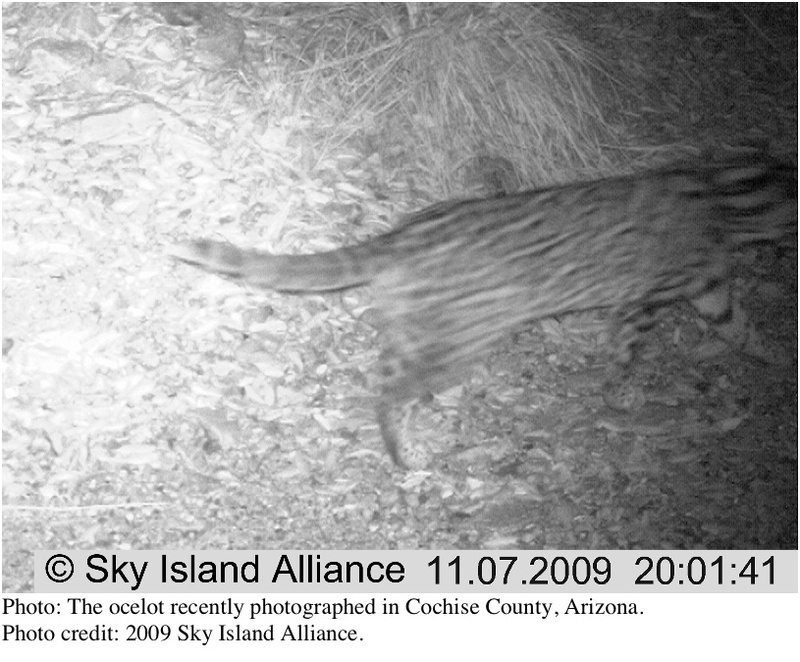 The ocelot photograph was snapped in Cochise County, Arizona by a game camera belonging to the Tucson-based conservation group Sky Island Alliance. The group has set out multiple cameras in the Sky Island region of Arizona along wildlife corridors in the hopes of capturing photos of rare wildlife. 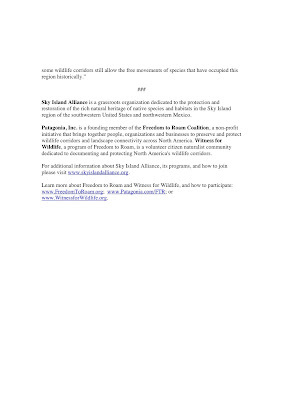 The project is part of the Witness For Wildlife program sponsored by the Freedom to Roam Coalition and the Patagonia Outdoor Clothing Company. Volunteer members of the group retrieved the images from a camera placed in a remote location. 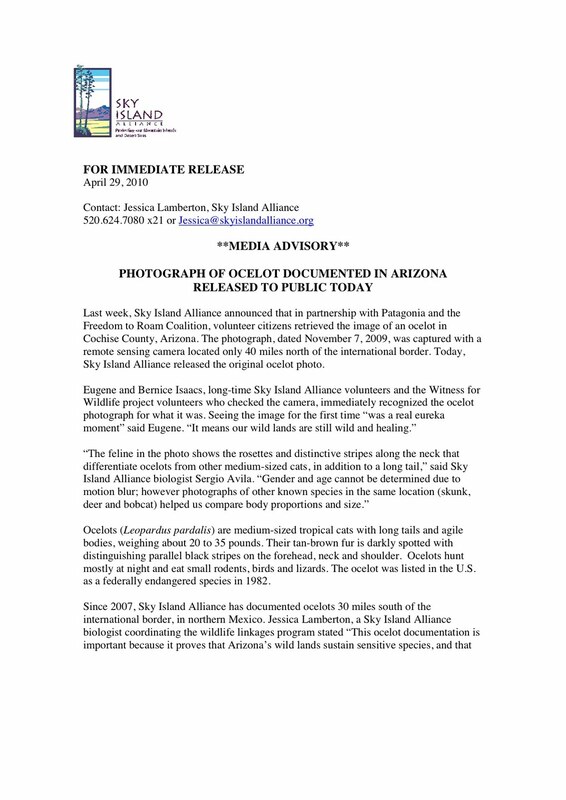 The photograph of the ocelot was dated November 7, 2009. 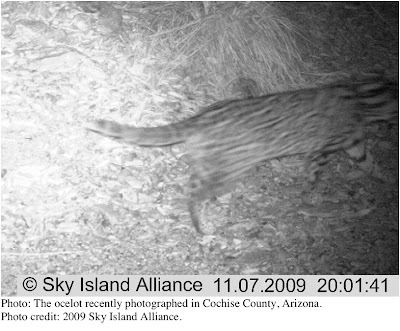 This is the first time an ocelot has ever been documented in Arizona. The area where the cat was photographed is at least a couple of hundred miles farther north than would be expected. 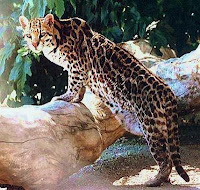 Ocelots are native to northern Mexico and south Texas but have become increasingly rare in recent years. The discovery of this cat in Arizona is as exciting as it is surprising. Once again, the value of remotely placed camera traps has been proven. The chances of a human seeing and photographing this ocelot were practically nil. Camera trapping is a tremendous tool in efforts to document what species are inhabiting certain areas. It is my hope that, as more cameras of a higher quality are placed in remote locations, we will make some amazing discoveries. I watched the old horror movie Pumpkinhead on television the other day. I have to admit to really liking this movie. I know in some ways it is a typical monster movie where rude and crude teenagers get what is coming to them. However, there is a lot of really creepy atmospheric stuff going on in this movie that you don't see in a lot of other films. The old pumpkin patch cemetery, the old witch that lives alone in the swamp that can "help" you for a price, and, not least of all, the weird kids outside the country store that chant the folkloric poem about "Pumpkinhead". I don't know if the "Pumpkinhead" poem is real or if it was created for the movie. I do know that folktales along these lines are not uncommon. The whole thing kind of got me thinking about some of the old tales I heard growing up in Southeast Texas. There were lots of really creepy stories. The ghost of Sarah Jane Road in Port Neches, the phantom Civil War battles said to still rage on nights when the moon is full at the site of the Battle of Sabine Pass, and the legendary lights of Bragg Road in Saratoga were all tales that held me transfixed as a youngster. To be honest, they still do. However, the story that fascinated me the most, and the one I thought about the most often while playing in the Piney Woods, was the story of the Raggedy Man or Ol' Mossyback, the legendary wild man of the Big Thicket. So, inspired by the creepy hick kids in the movie, I decided to try my hand at writing a poem about this legend that people still whisper about today. I'm not much of a poet but my best effort is below. If you decide to comment...well, be kind. A legend called Ol' Mossyback. As it does to this very day. To the justice of Ol' Mossyback. And they, too, would come to know his name. Would all end up in vain. All have crossed this Raggedy Man's path. So as not to risk his wrath. But the eyes of Ol' Mossy Back. It seems that the Cornell Lab of Ornithology is officially giving up on the Ivory-billed Woodpecker. According to an article on the Discovery News website, written by Jorge Ribas, biologists are giving up their search for a remnant population of the legendary birds. The article, written by Jorge Ribas, can be read in its entirety here. 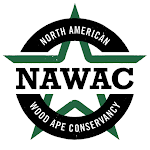 Ron Rohrbaugh, director of the Cornell Lab, said, "The preliminary conclusion we've come up with at this point is that it's unlikely that there are recoverable populations of Ivory-billed Woodpeckers in those places that have received significant search efforts over the past five years." Despite sighting reports and extensive searches in the Black Swamp of Arkansas no definitive evidence of the elusive woodpecker's existence has been found. The searches were prompted by a video shot by David Luneau that, while a bit grainy, appeared to show a living IBW in flight. I have heard from a reliable source that most at Cornell believe the film does indeed show an Ivory-billed Woodpecker. I think this belief may be reflected in how Rohrbaugh worded his statement. He said that it was not likely there were "recoverable populations of Ivory-billed Woodpeckers." He did not say he believed the birds to be completely extinct or that the Luneau video did not show a living IBW. To the contrary, Rohrbaugh and his Cornell associates must have believed the film showed a genuine IBW to have spent so much time and money in its pursuit. Personally, I believe the Ivory-billed Woodpecker is still out there. Whether there are enough birds left to successfully keep the species alive for ten or twenty more years I cannot say. However, if even one breeding pair is left there is hope. 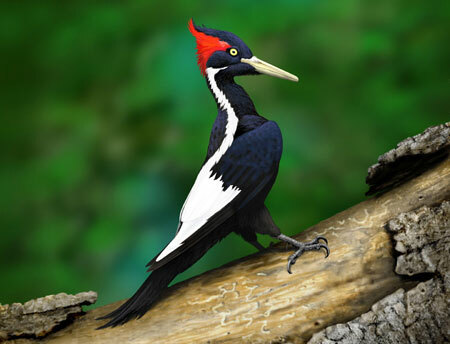 Below is a short video showing a story, seemingly aired on a PBS program, that recounts the memories of an old man who claims to have seen not one but three Ivory-billed woodpeckers in Northeastern Louisiana back in the late 1930s. The story also features footage of Ivory-billed woodpecker mounts in a museum. Once again, I am indebted to my friend Alton Higgins for finding and providing me with this link. Here is a link to an article in the Port Arthur News dealing with big gar in Texas' Trinity River. In the article, Chester Moore, Jr. documents his interview with Jeremy Wade the host of the Animal Planet show River Monsters. The show documents Wade's search for giant fresh water fish around the world. One of the first shows was about the large gar in the Trinity River of Texas. Wade had this to say about the alligator gar of the Lone Star State, "Each of the species is unique in its own way so it's kind of hard to compare but the alligator garfish definitely ranks high in among the 'river monsters' out there." Check out the entire article. It is a good read. Also, note this is part one of an interview with Jeremy Wade. Make sure and check back soon for part two of Moore's interview. I pulled my game camera yesterday. It wasn't due to be serviced or removed until this weekend but I was anxious to see how it performed. This is a new digital model that I hope will be a big improvement over the old 35mm cameras I have used in the past. The camera was placed in what I call "Location 1". This is a spot where a woman claimed to have seen a large cat cross the road a while back. While I never captured a photo of a cat at this spot with the old 35mm camera I had out there I did get photos of quite a variety of wildlife. It is close to my house so it was an ideal location to try the new camera out. I did not want to go to too much trouble placing the camera in a hard to get to spot until I was sure it would perform well enough to be worth the trouble. After I pulled the camera, I discovered it had snapped 18 photos in the 24 days it was in the field. This seems like a pretty good ratio to me as the old 35mm camera would typically snap only 4-10 pictures. The picture quality of the photos is good and I was impressed by just how far out the camera was able to sense movement. As expected, nearly all the shots were of white-tailed deer. I was pleased to get several shots with multiple deer. I never got photos of multiple animals using the old 35mm cameras. I have included some of the deer photos below. I have included shots that demonstrate the range of the camera, that show multiple animals, and some that I just like. The jewels of the bunch, however, were two pictures of coyotes. In all the time I had the 35mm camera out in this same location I managed to capture only one picture of a coyote. In only 24 days in the field with the new digital model I got two coyote shots. It could be that no coyotes came by while the 35mm was out but it seems more likely that the old camera was missing shots. As I mentioned before, the 35mm never captured more than 10 images in the four weeks I would leave it out so it seems likely I was missing animals. The first picture of a coyote is my favorite. He's a healthy looking specimen and pretty good sized with a thick muscular neck. I initially thought the second photo was just the second in a series of photos of the same coyote. However, you will notice the time stamp shows that the second photo, while taken the same night, was snapped nearly two hours later. It is likely the same animal but, and this could be my imagination, the coyote in the second picture seems to have a bit more red in its coat. It also seems a bit smaller. This, however, could simply be a trick of perspective as the animal in the second photo is farther from the camera. In any case, I was very pleased to get these two shots. All in all, I am pleased with the performance of this camera. The images are good, the range is good, the price was reasonable, and it being a digital makes it head and shoulders above my old 35mm models. The one concern I do have is with the battery life. I will typically leave a camera out at least four weeks before checking them. This camera was out a little less than four weeks (24 days) and the batteries were dead when I arrived. Having to replace batteries more often definitely makes things more difficult. I can only get out so often. It will get even more difficult with the addition of more cameras. Then again, what else would I rather be doing? An article in the April 5th online edition of the London Daily Telegraph documents the capture of a strange creature that has been dubbed the "Oriental Yeti". The strange hairless creature has eluded classification by the scientists that have been able to examine it to this point. 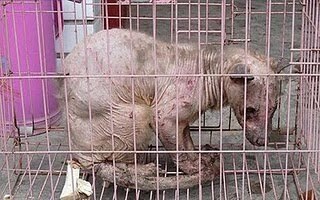 The animal was trapped in a remote area of the Sichuan Province by local villagers. The article does not give specifics as to the size of the animal but it must have been a fairly large creature based on several statements in the article. For example, a person identified as Hunter Lu Chin is quoted as saying, "It looks a bit like a bear but it doesn't have any fur and it has a tail like a kangaroo." The article also mentions that the creature was caught after locals had reported seeing what they thought was a bear. The article then references a local folkloric tale that tells the story of a bear that once was a man. Apparently, some locals feel this is the animal that has been captured. The article mentions that the creature has a, "voice like a cat," and that it will soon be sent to Beijing where DNA tests will be performed in an attempt to positively identify the species to which this animal belongs. You can read the London Daily Telegraph article here. After viewing the photo of this odd looking "Oriental Yeti" I was reminded of the various hairless canid-like animals being seen here in Texas on a regular basis over the last few years. These odd looking creatures are being called "blue dogs" and, ever increasingly, "chupacabras". 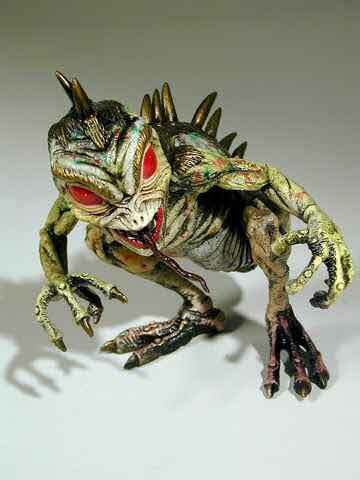 The chupacabra, of course, is a cryptid whose legend began in Latin America, specifically Puerto Rico. Also called the "goat sucker", the chupacabra supposedly attacks small domestic animals like chickens, goats, and sheep. It is said it kills by making two small puncture wounds on its victim through which it drains its blood. Usually, no other marks are present on the body of the victim. Immigration has brought the legend of the chupacabra to America. 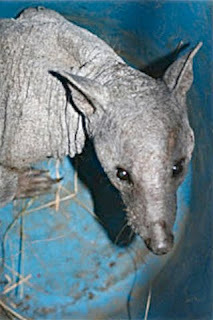 It seems any hairless animal that is captured or killed is being categorized as a chupacabra these days. 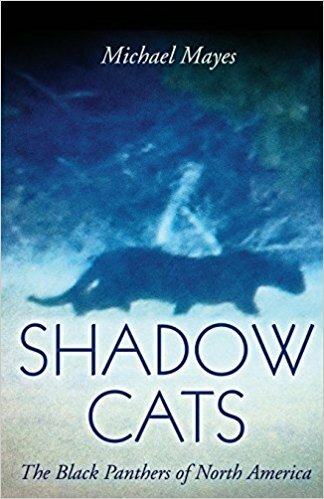 Strangely, the original descriptions of the chupacabra don't resemble anything close to the strange creatures being seen now. The chupacabra, according to early reports, was an upright alien looking creature with large glowing eyes, spikes protruding off its back, and large claws (see photo below). The blue dogs of Texas, while certainly odd, look nothing like this. That has not stopped the media from dubbing these hairless creatures as chupacabras, however. I have actually seen one of these blue dogs in the Sam Houston National Forest just outside of Conroe, Texas. A fellow TBRC member and I were returning from a camera maintenance trip in the Big Thicket National Preserve. Our route home took us through the heart of the SHNF. On a whim we decided to drive down a forest service road and take a look around. We had not gone very far when we spotted an animal in the road. As we got closer we were surprised to see a hairless creature somewhere between 18 and 24 inches high. The animal trotted across the road and into the forest. Once in the brush the creature froze. It was difficult to see in the shadows but stayed still for about a minute affording us a good look. The animal had bluish grey skin that resembled that of an elephant. It also had a long whip-like tail. It was a truly strange site. Strange as it was, however, the animal was clearly a canine of some sort. My guess is that it was a coyote with a terrible case of mange. It looked similar to an animal filmed by a police officer near Cuero, Texas a couple of years ago. You can view that video below. 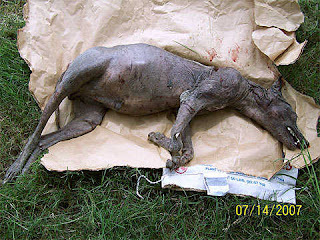 Other animals have also been suffering from this condition (mange) of over the last few years. For example, the photo below is of a raccoon that has lost its fur due to a bad case of mange. As you can see, it is very difficult to identify an animal that has lost its hair. The photo above does not look like a raccoon at all. Animals tend to look totally alien and more fierce without their fur. I haven't seen any evidence to date that makes me think these animals are the legendary chupacabra or a totally new species. 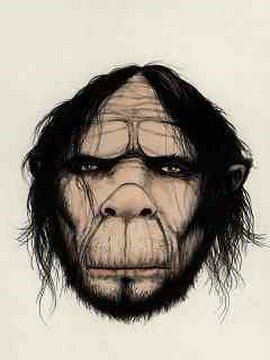 My best guess is that DNA tests on the "Oriental Yeti" will show the creature is simply an animal common to the region that is suffering from mange or some other skin disease. I do know for sure that it is not a yeti. The media labeling it as such is unfortunate. Two separate pieces of video shot by scientists involved in a long term study of gorillas in the Congo show that these great apes, like several of their cousins, have the ability to problem solve at a high level and create tools to help them cope with environmental challenges. The video can be viewed below. You will have to sit through a short commercial featuring an undocumented species of talking gecko but it is well worth the wait. The importance of this individual discovery is explained well enough in the video so I will not rehash that here. I would like to stress, however, that this discovery should, once again, remind us not to underestimate the intelligence of the great apes. 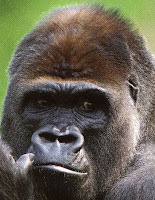 Time and again over the last few years new behaviors have been observed in chimps, bonobos, orangutans, and gorillas. Behaviors never before seen by scientists. Behaviors that may have been reported periodically by native peoples but dismissed as folklore by mainstream researchers. Fishing, swimming, hunting, whistling, hand clapping, and the ability to understand, at least on a rudimentary level, the future and make plans for it have all been observed in the great apes. Also, evidence has been uncovered showing the very real possibility that the building blocks of language may exist in wild orangutans. Those who research the documented great apes and those who seek apes of the undocumented kind should all take heed. Reports of behaviors that may seem outlandish because they have never been observed before should not be dismissed out of hand as myth. An open mind is critical to any scientific endeavor. A good scientist does not dismiss evidence that does not fit his/her preconceived notions. Instead, a good scientist goes where the evidence leads. Evidence that doesn't seem to fit what is known about a documented species shouldn't be automatically discarded. It should be catalogued and held onto. Future discoveries may prove that the unusual data is more than just an anomaly. If every researcher automatically assumes any unusual data they collect is tainted or an anomaly and discards it we may miss out on something important. The scenario where multiple researchers in different locations make the same unusual discovery, decide it is tainted or a fluke, and then toss the data is a real one to me. If researchers would publish their data, even the seemingly anomalous findings, they might find that others who could confirm their findings. I want to stress that I'm not talking about grand conspiracy theories to suppress unusual discoveries in regard to great ape behavior or the existence of undocumented apes. I don't think any such conspiracy exists. Certainly one anomalous piece of evidence should not be enough to change the way we view a species. I'm just asking that the anomalous evidence not be forgotten or discarded since it doesn't seem to fit our view of things. That way, if the same, seemingly anomalous, evidence is observed again at a later date, or by a different researcher, it can be reconsidered. Once something is observed multiple times a case can begin to be built that the current view of things might need to be altered. On different note, I locked onto what gorilla researcher Emma Stokes said at the end of the video. To paraphrase, she said that this discovery shows the benefits of long-term observation projects. Such projects have yielded mountains of data on many species across the globe. 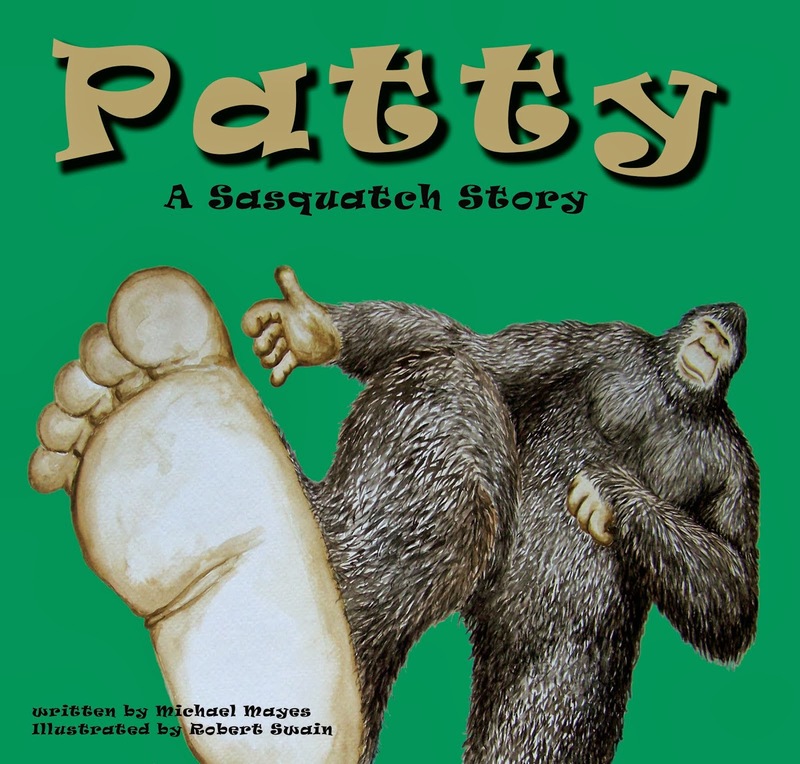 It has long been my opinion, and I'm not alone in this, that a well-funded long-term observation project could very well be the way the sasquatch is finally officially documented. I have at least one well-qualified friend, and fellow TBRC member, who has stated publicly that he would gladly give up his day job and live in a remote observation post for months at a time if a donor would step up and match his annual salary. Hopefully, such funding will become available in the future.